Due to a wave of unusually cold weather and consequent insurance claims, FGI faces a lot more data processing requirements than Pied Piper is expected to handle, and the team is facing an astronomical bill from their data storage center provider for the sudden spike. Richard decides to attract investment from another client to handle this, approaching Erlich so that he gets Keenan Feldspar to hear their pitch. 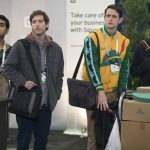 Richard thinks Feldspar’s VR tech is a fad, but Dinesh and Gilfoyle are so impressed after trying it that they integrate Pied Piper’s middle out algorithm into Feldspar’s VR, which improves it greatly. As a result Feldspar offers to acquire Pied Piper altogether. Richard doesn’t want this, so he counters with an offer of $25 million, which Keenan still accepts. Richard intends to concede, but Monica warns him that Feldspar’s VR isn’t that great and that he’s walking into a trap, promising that she will fund their series A round if they can implement the decentralized internet project on a sufficient number of cell phones. After texting him telling him the deal is off, Richard learns that Feldspar has signed with Hooli, abandoning Erlich in the process. Richard decides to enter Hooli-Con, Hooli’s tech conference, to put Monica’s challenge into practice.